Nitenpyram tablets treat flea infestations on pets. Starts killing adult fleas on the pet within 30 minutes. Use when pets are likely to be exposed to fleas, such as in dog parks, at shows, or other areas. Also may be used prior to surgery, boarding, or grooming. Active ingredient nitenpyram, interferes with the normal nerve transmission of insects, effectively killing them. Not a preventive. Safe enough to give as often as once a day. CAPSTAR Tablets begin working within 30 minutes. In studies, CAPSTAR achieved greater than 90% effectiveness against adult fleas on dogs within 4 hours and cats within 6 hours. CAPSTAR Tablets are safe for pregnant or nursing dogs and cats. When using this product, you may notice that your dog or cat will start scratching itself as fleas begin to die. The scratching behavior is temporary and is a reaction to the fleas, not the drug. In very rare cases in cats, this may present as transient signs of hyperactivity, panting, vocalization and excessive grooming. CAPSTAR Tablets kill adult fleas that cause flea allergy dermatitis (FAD). 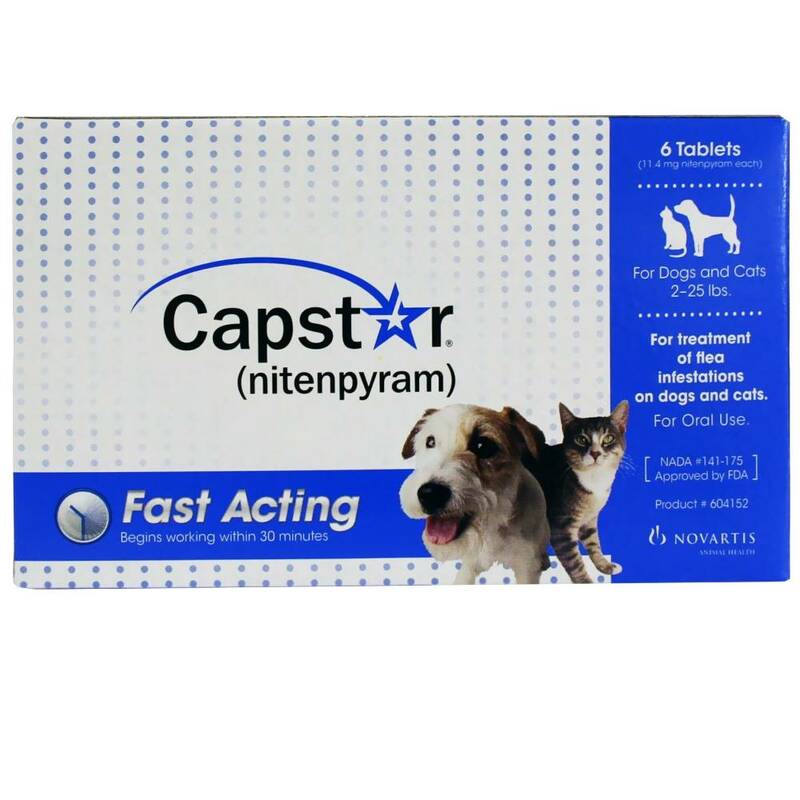 CAPSTAR Tablets may be used together with other products, including heartworm preventives, corticosteroids, antibiotics, vaccines, de-worming medications, shampoos and other flea products.